So when I got the opportunity to work with Snapware, I wanted to kiss their face! They are a company after my own heart! The first product I got to review was the Snapware Snap N' Stack Two Layer Cupcake and Cookie Carrier. I have been wanting a product like this for a long time! I love this thing! You can fit 24 cupcakes in it, and even more cookies! There are two trays, and each one is reversible. The cupcake side has little circles made into it to sit your cupcakes in, and the other side is just the plain tray to stack your cookies in. You can even fit a quarter sheet cake inside! 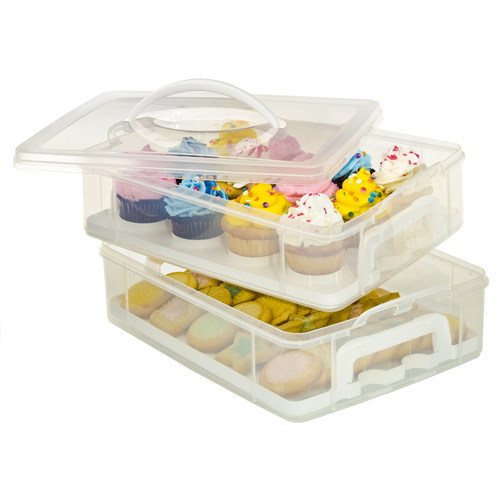 The carrier is top rack dishwasher safe, microwave safe and freezer safe! I really like this product, and I will definitely use it with the holidays approaching, and especially to take treats to Tater's class! Yay! If you are interested in Snapware's awesome home organization products, just click here! Thanks Snapware, for letting me review your great products! 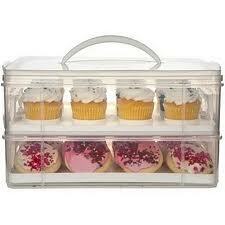 *UPDATE: Do you wanna win this awesome cupcake/cookie carrier from Snapware! ? Well, they are giving it away! disclosure: i received a sample product in order to conduct this review. Although I received a product, all opinions are my own and no monetary compensation was given. I would like to have the 4.1 pet treat canisters. I like the Glasslock 4 Piece Rectangular Airtight Food Storage Container Set. I like the 17.1 Cup Pet Treat Canisters. Another great item of theirs I'd love is the 17.1 cup pet canister! I would love the 14-piece Snapware Food Storage System! I'd love to have the 17.1 cup pet cannister. I like the Make a gift containers.Thanks for the chance. I would love to have the 2 layer ornament box. I could use the Yarn-Tainer. This is what I want the most! I am a room mom so I would use this alot for parties and family get togethers! I like the canister set too! I entered candles by Phebes! I would love this for storing my makeup. It would keep it dust free. 19.50" x 15.50" x 11.00"
Joined Snapware and told them you sent me. I like the snapware cereal containers. I like the 2 Layer Sandwich Box. I would like to try the medium yarn-tainer. I like the Small 3 Layer Square with One Divided Tray. i would like the two layer sandwich box. I love their Glasslock products!! I entered your ecover giveaway. I entered your Umi giveaway. I entered your Snapware Storage giveaway. I entered your Snapware Canister giveaway. I own some Snapware, it's fantastic!!! I'd LOVE to win a cute pet food cannister. I have two 'granddogs' and their pet food/storage area is a mess. These are such cute cannisters. Maybe one for the little dog, one for the big dog. My thanks to my friend Amy Rouse for telling me about this site!!! I love the 4.1 Cup Airtight Canister (Seasonal Stocking Design) to make your own gift. Cute! I'd want to try the smart store bins. I like the ribbon dispenser! I would also love to have a few of the Snap 'N Stack Small 4 Layer Square with One Divided Tray. I like the small 3-layer snap n stack! I like the Snap 'N Stack X-Large 2 Layer Ornament Box. I like the Snap'N Stack 3 layer large storage.